John Colson FRS (1680–1760) was an English clergyman and mathematician, Lucasian Professor of Mathematics at Cambridge University. 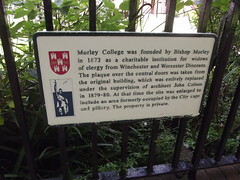 Morley College was founded by Bishop Morley in 1672 as a charitable institution for widows of clergy from Winchester and Worcester Dioceses. The plaque ove the central doors was taken from the original building, which was entirely replaced under the supervision of architect John Colson in 1879-80. At that time the site was enlarged to include an area formerly occupied by the City cage and pillory. The property is private.